alert <string> The text message to display to the user. No localization arguments are supported. badge <number> If non-zero, it displays the number on the icon of the application. If zero, no number is displayed. 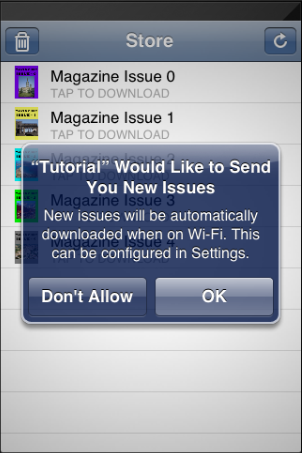 content-available 0 | 1 Non-zero indicates a Newsstand push message. The receipt of this will wake the viewer to begin a background download. See Notes. sound "default" Only the default notification sound is supported. Background downloads are limited to once every 24 hours, +/- 1 hour (or so). You can send as many alert messages you like, but only background downloading will be throttled. Background downloading will only happen over WiFi connections. If the user is on 3G and the push is received, the background download is lost. A valid subscription via Apple or direct entitlement (CDS, TCS, PCD, Dovetail, or other) must exist. Only the most recent folio will be background-downloaded. The user must be entitled to this content. Apple attempts a number of times to deliver the push payload. As such, the actual download may begin a significant amount of time after it was originally sent or scheduled.